Last blog post I was still in Connecticut. As of now I am in California again. 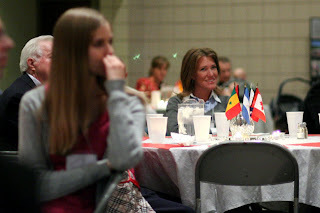 As for the conference in CT, I was happy to be included in the weekend activities, to meet up with some missionaries that Calvary supports that I didn't know about and a few others that I knew but hadn't seen in a while. My own brother was included and that was pretty weird! I arrived in CA last Monday afternoon and booked it back up to the mountains where I met fellow recruiters for our bi-annual recruiters retreat. Always a good time of reconnecting and refocusing. For me this time, it was actually a bit difficult as I was caught in the middle of a time of development for my ministry in our organization. We are just now really deciding and developing the programs that we want to see available so it's hard to report on that kind of work. We did gather more up to date information on what our organization is doing to further the work of Bible Translation and it was encouraging to hear that we will be starting a significant initiative to actually see the Bible translations of the world begun soon! Right now I have a family from Wisconsin visiting me and another friend from Georgia arriving tomorrow. There are web seminars to attend throughout the next few weeks and a new idea brewing in my head that may become reality this year! My resource book for teens about missions is coming along. The other two girls who are working on it with me are doing well also! So far so good! I haven't connected in person with my students in youth group but have texted a few of them this last week. Seems that everyones lives are just racing along. I am so grateful for texting, as it really does keep me in touch with my girls better than anything else does! yeah, yeah, I know... "technology"!